Hibiscadelphus distans is a shrub or small tree that grows up to 5 meters tall. The leaves are heart-shaped, typically 4-10 cm in length, with irregular (rounded) serations on the margins. Both upper and lower leaf surfaces have branched stellate (star-shaped) hairs. Unlike most other Hawaiian members of the Mallow (Malvaceae) family which are radially symmetric, the flowers of Hibiscadelphus distans are bilaterally symmetric. The flowers are 3-4 cm long and are subtended by triangular green bracts. The calyx is largely fused to form a tube surrounding the petals which are greenish yellow and turn maroon with age. The fruit of Hau kuahiwi is a woody capsule (2.5 cm long, 1.5 cm wide) that becomes dry when mature and splits open to release the seeds. The capsule is divided into five sections with two seeds in each section that are about 5 mm long and covered with fine yellowish brown hairs. Hibiscadelphus distans is found only on the island of Kaua’i, Hawai`i. This species is found in a single natural population above Koai’e Stream in Waimea Canyon in a small remnant patch of open, dry forest at approximately 350 m in elevation. This region receives approximately 150 cm of rain annually and has a yearly mean temperature that ranges from 18.5 to 25.7 oC (65 to 78 oF). 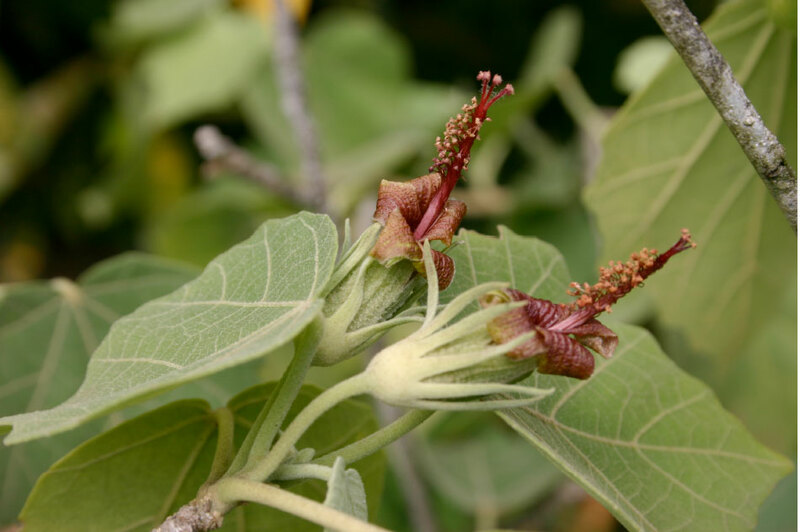 Kauai Hau Kuahiwi is endemic to Kaua’i meaning this is the only location in the world where this species is found. This species is listed as an endangered species by the US Fish and Wildlife Service. The only known populations are in Koai`e canyon in the Pu`u Ka Pele Forest Reserve, Waimea Canyon, Kaua`i and include 106 known individuals. It is estimated that less than 200 individuals persist in the wild. © 2018 Maui Cultural Lands Inc. | All Rights Reserved. | Site By: Eh Team Inc.